After a long and fairly stormless winter, the Northeast NSW chasers were desperate for some storm action. AVN was forecasting a nice, but high risk setup for Northeast NSW and Southeast QLD. A dryline was situated from about 30S extending WNW into Southern QLD and AVN was forecasting LIs of around -4 to -6 in the region. 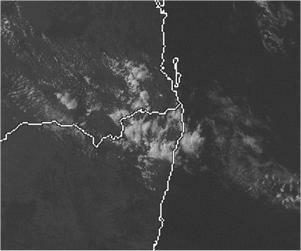 Cape was forecast at a maximum of around 1000 in the Northern Rivers. 850hpa and 500hpa temps were a little high, with 19C at 850 and -15 at 500, however there was a cooling trend in the atmosphere. Moisture was a concern, with the lower and upper levels fairly dry apart from a slot of very moist air around 800hpa. 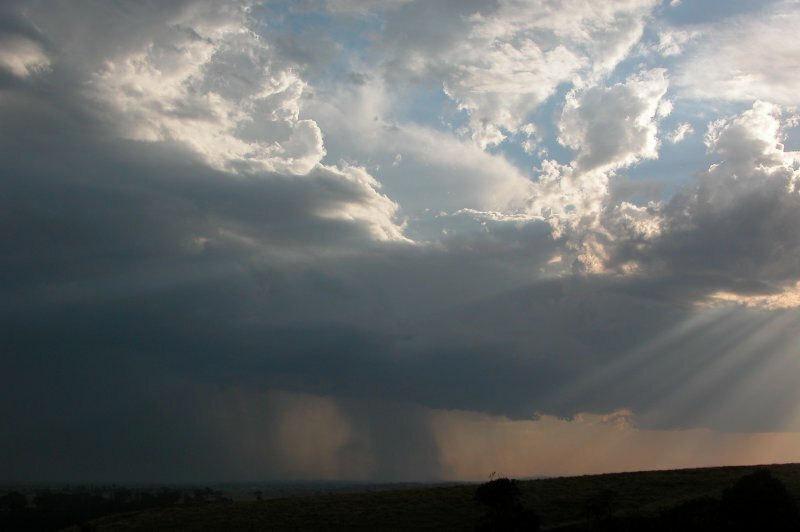 It seemed that there would be just enough moisture for some sort of convection to get going. Shear was strong, with N'ly winds at the surface turning to W by 600hpa and reaching 45kn by 500hpa. We expected storms to head ESE. If the problems of low moisture and capping could be overcome, we were in for an interesting afternoon! Weak cells started developing on the ranges to the NW by late morning and moving into the Northern Rivers by around midday. 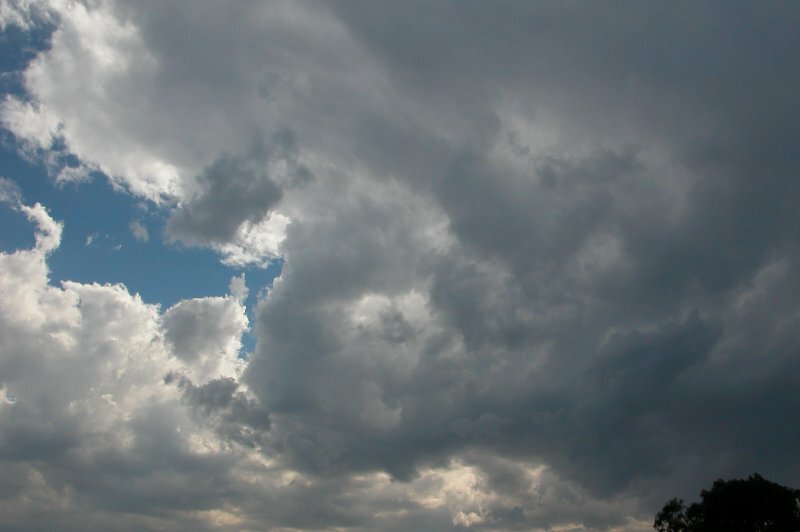 The sky was filled with low topped and high based storms by 12.30pm, with radar showing yellow reflectivities in the small cores of the cells. 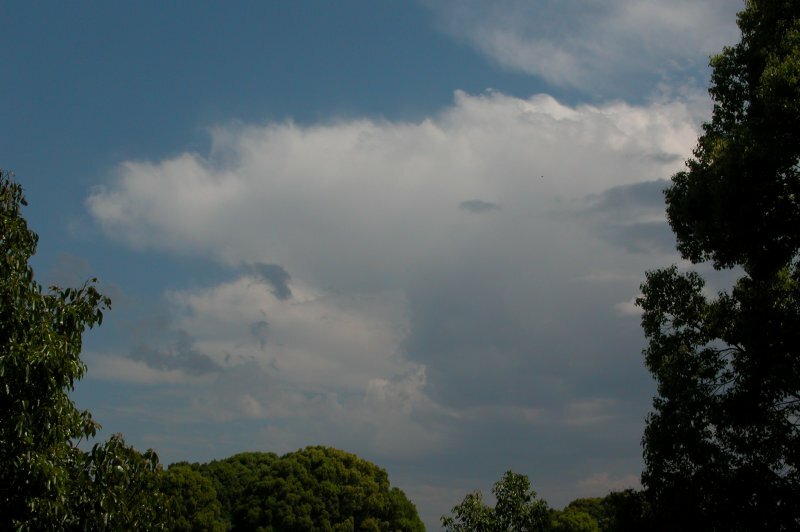 Thunder was also audible in the anvils close by, but very infrequent. As the storms moved closer to the coast they intensified, with one cell dropping pea sized hail in Goonellabah. Radar showed a whole cluster of cells reaching pink on radar between Lismore and Ballina. By 1.30pm some stronger looking cells had formed on radar SW of Casino. Michael and I decided to head to Tregeagle for a look. The view was rather discouraging. The original activity had moved offshore, and the cells to the SW looked very moisture starved. Nothing was really looking interesting, however some congestus developed to our WNW and put out an anvil fairly quickly. It was also high based and low topped, so we weren't expecting much out of it. I had a doctor's appointment at 2.30pm in Alstonville, so I had to head into town. I left Michael and began the 15min trip into Alstonville. I got home just after 3.10pm to a mammatus filled sky and nice updrafts to the ESE. 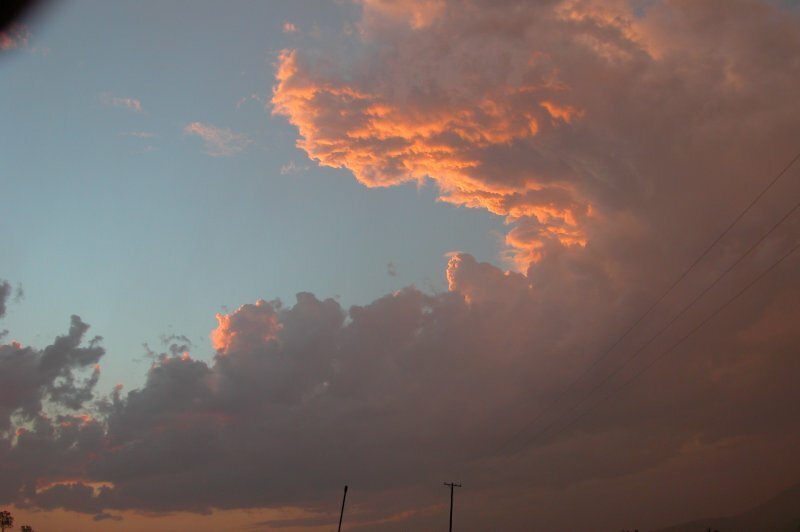 Just before getting home I stopped to photograph a cell to the NW which had an interesting inflow feature into it. The feature gradually detached and soon disappeared. There now appeared to be storms everywhere! 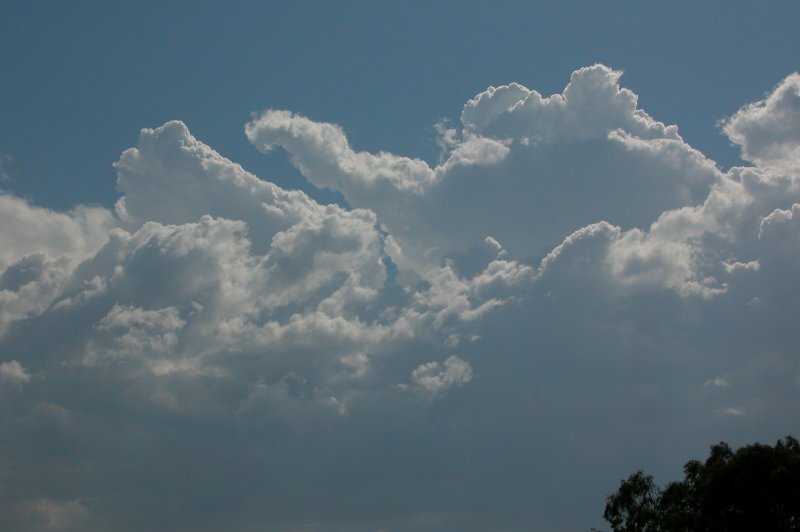 Storms now had more vertical development, and were reaching further into the atmosphere. 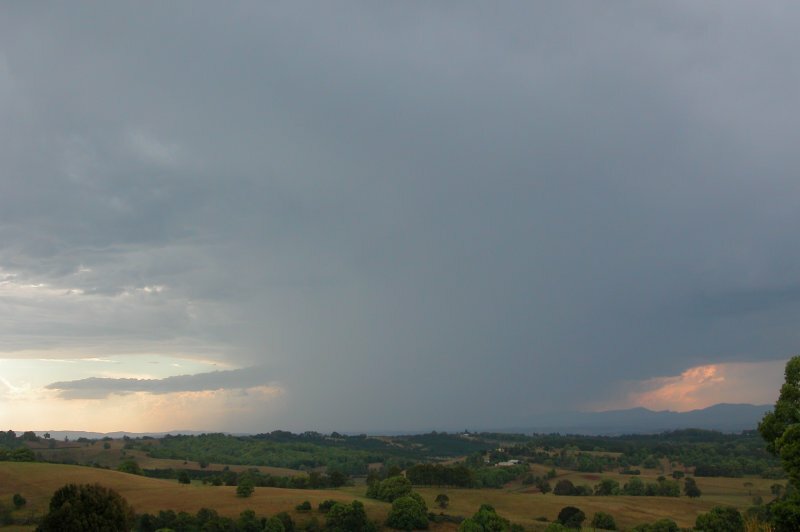 A cell on the ranges o the N was putting out a massive anvil and appeared to have heavy precipitation. 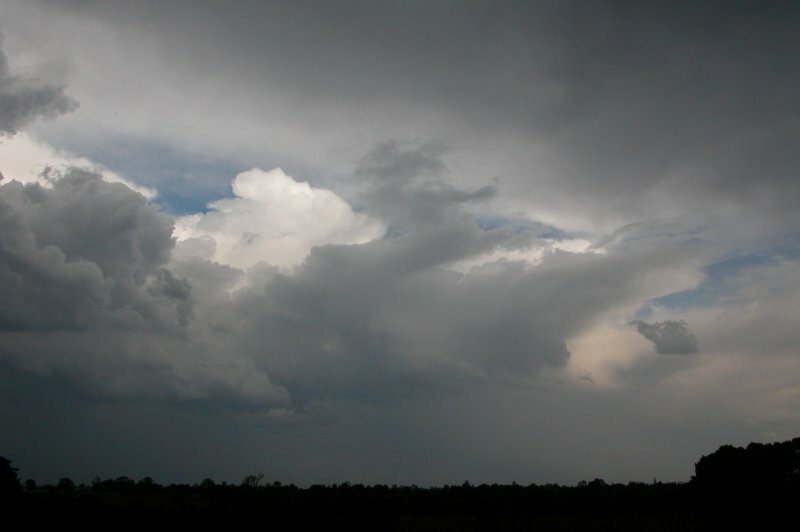 Crisp updrafts also appeared at the rear of the cell. 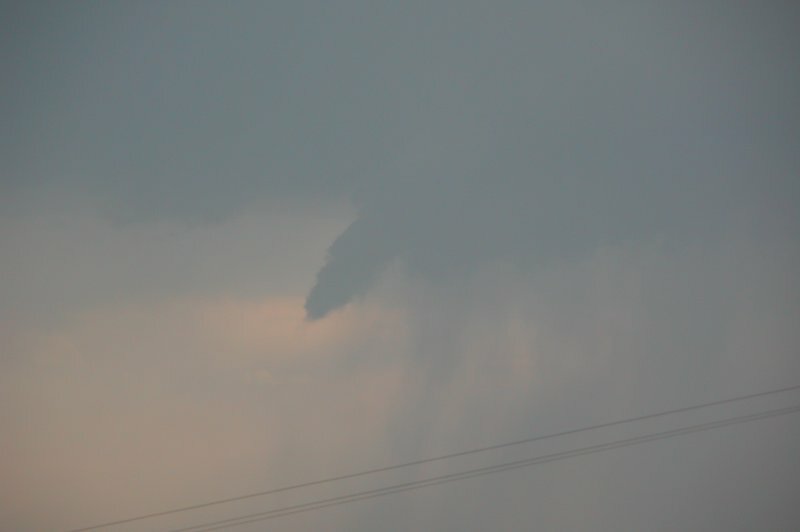 I also spotted what looked like a funnel on one cell to the NE, but it was just some non-rotating lowering. 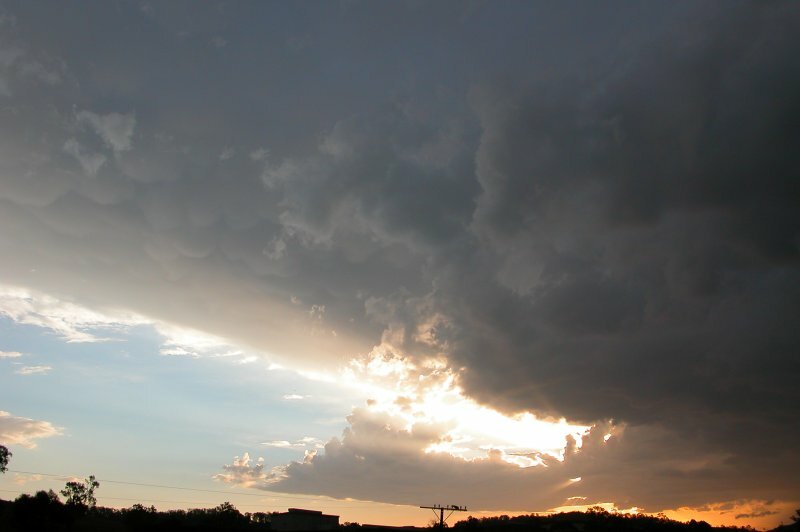 Mammatus continued to develop in intensity. 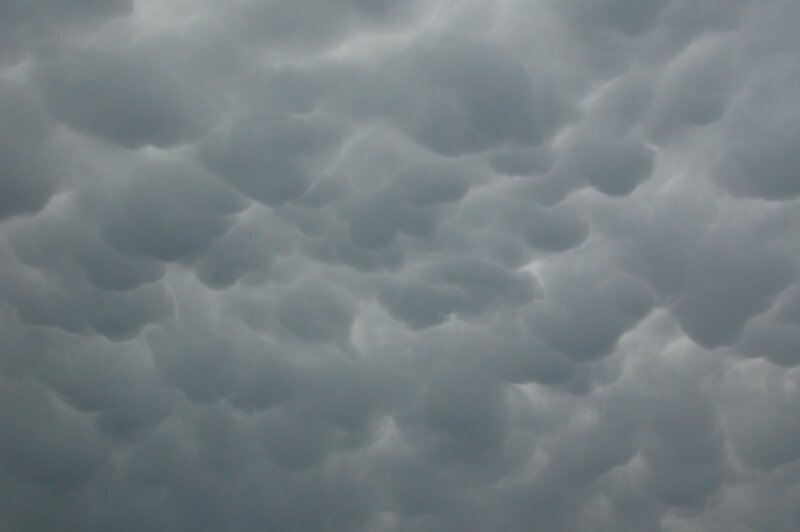 It was the best display of mammatus I had seen! Around 4.00pm Michael and I headed out again to watch activity that was moving off the Northern Tablelands into the Northern Rivers, just SW of Casino. Radar indicated a splitting cell as we left, with two red cores. An STA had been issued for the area so we were expecting something decent. We first stopped near the Tregeagle primary school at 4.10pm, however the view of the cells wasn't so great with the sunrays shining in our eyes and on the storm. After a few quick photos we headed to Parrots Nest. We began to see CGs from the cell just S of Casino in the precipitation region, which looked quite heavy! We watched as more precipitation began to develop in a line extending NW from the original cell that was now just to our SSW. This area eventually gave off some CGs which was lovely to see and the thunder was also enjoyable! The new precipitation region began to weaken as another more compact precipitation shaft developed almost west of us. 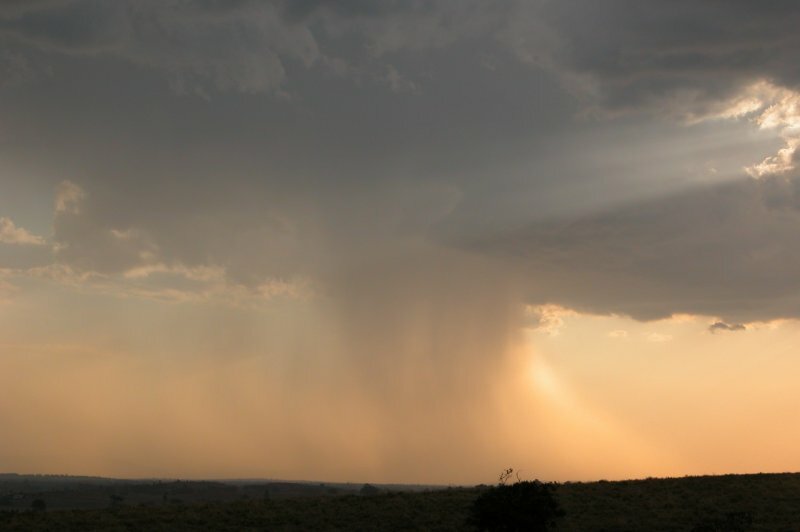 All precipitation shafts we saw exhibited microbursts. 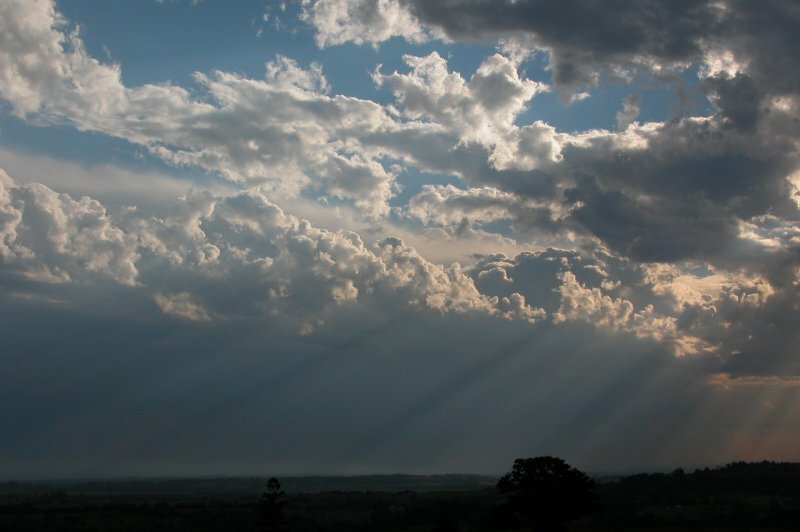 The tops of these cells were becoming obscured by anvil from a bigger storm to our NW. 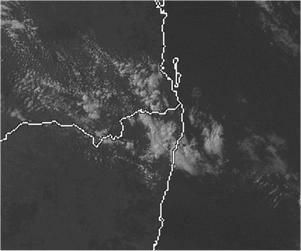 Around 5pm Ray Mullens called to inform us of a cell in the red heading for Lismore, but still 60km away. 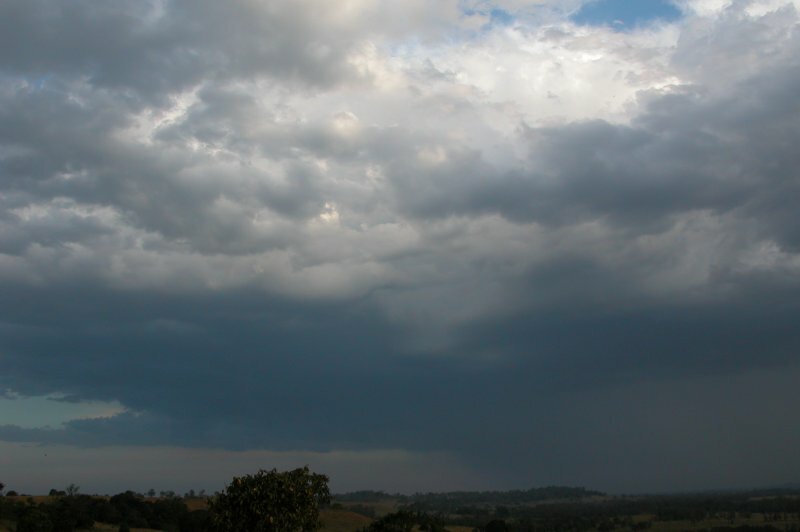 As the activity we were watching seemed to be losing intensity, we headed for Kyogle to try and intercept the bigger cell. 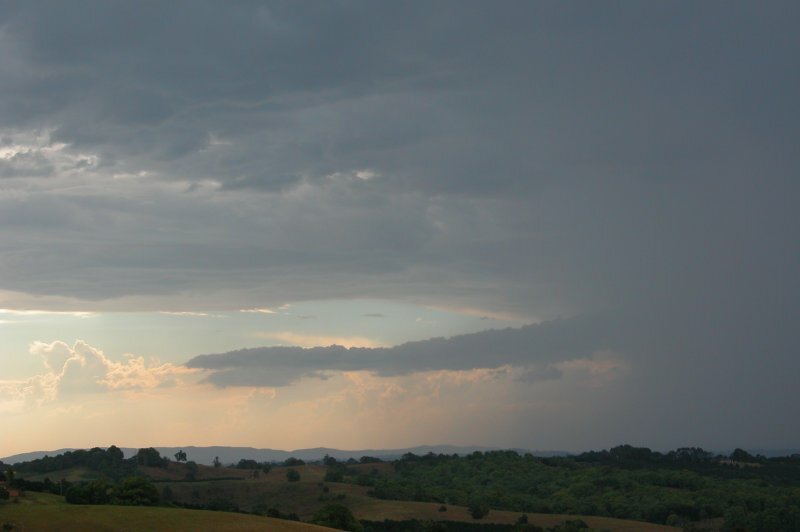 We stopped briefly just out of Lismore to photograph the large anvil with nice mammatus coming from the cell. The contrast was great with the lowered sun! 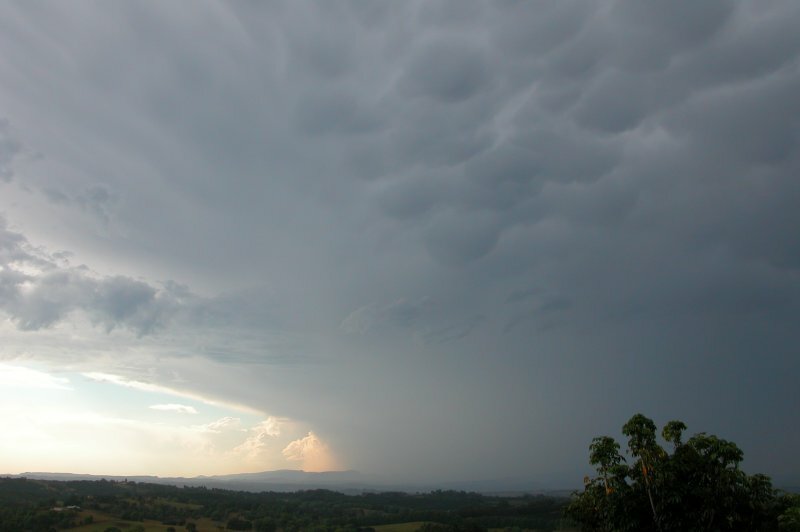 After the quick stop we continued towards Kyogle, noticing CGs and CCs from the cell we were after, however as we came to Bentley, the storms appeared to weaken. 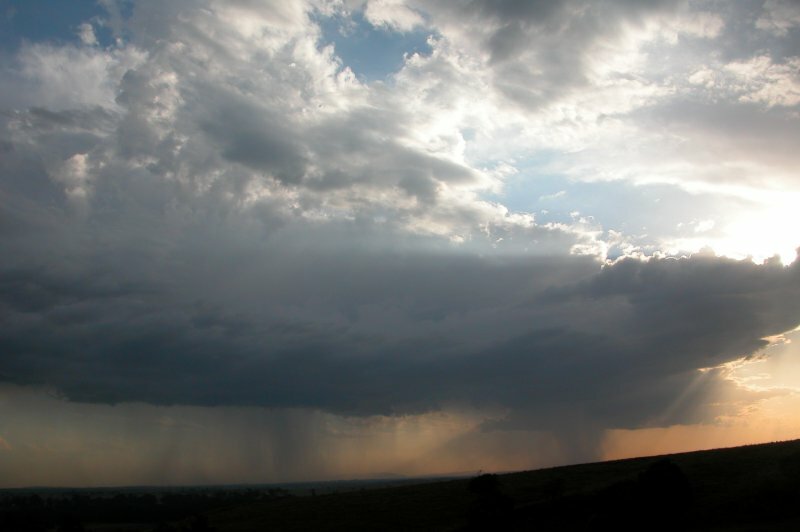 We stopped and waited for what looked like a shaft of heavy precipitation from the cell to move over us. We were both hoping for hail, but were not overly confident of seeing any. The rain eventually hit and was very heavy. We thought we heard a few "pings" on the roof from hail, but did not observe any. We decided to head back with the cell to Lismore, enjoying the heavy rain. It wasn't long after we began the journey back to town in the heavy rain that we heard a loud bang on the roof. We both looked at each other with that look on our faces of "is that what we think it is" --bang! Another one! And then it hit! 1cm hail began smacking into the car, with plenty of loud banging noises. We were so excited!! We stopped to film it on the road and enjoy it! Hail increased in size to about 1.5cm, with the heavy rain continuing. It soon eased off and we headed off again, but didn’t seem to find any hail. We stopped soon after to photograph the back end of the cell that was being illuminated by the last bit of sunlight. As we got to the outskirts of Lismore we heard a few more bangs. We must be close to the hail core we thought. As we got into South Lismore it hit again! 1.5cm to 2cm hail began pounding the car! I got out of the car into the hail to try and collect some larger stones. An old woman inside her house was looking at me strangely as I collected hail from her lawn. We confirmed stones were 2cm. When I got back in the car, the hail came down really heavy, with most stones now 2cm, maybe increasing to 2.5cm. There was a decent covering of hail on the ground now, but the hail soon ceased and we headed back home. On the way back home the rear of the hailstorm became visible and looked impressive. 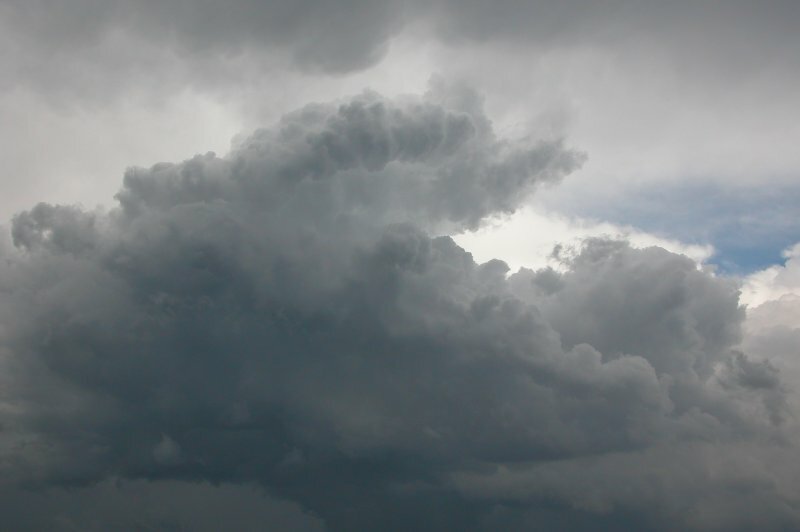 A nice solid updraft was feeding into the cell with a solid anvil with mammatus. Lightning was infrequent in this cell, but cells further north were giving off regular flashes. We headed to Alstonville in the hope to get some lightning photos, but the lightning wasn't very impressive so we called it a day. A great start to the chasing season! From TWC Weatherzone at 2pm and 3pm local.